I wonder how much it will be once they have launched it. I already has a 240 volt capacity. It's a very exciting prototype from Behmor that will be well priced compared to similar prosumer equipment but this hasn't started compliance testing and is a long way off manufacturing so don't hold your breath or ask "are we there yet?" You can use the [contact us] to get added to a notification list and we'll give updates as we get them. Dimal, greenman, Javaphile and 1 others like this. I'm keen on this! Looking for something (ready to go) in the 1-2kg category and looks schmick. 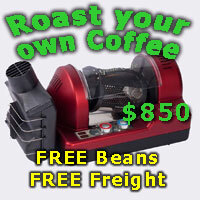 Ideally want a gas roaster, but looks pretty darn good based on that vimeo video. Stumbled across these data sheets on Reddit, the guy who posted it said Joe Behm popped it up on his facebook page. I'm really curious as to which manufacturers took deposits on vapour roasters? Got to see the video before it was hidden. Looked like a conventional electrikery element powered drum roaster to me. At the 1kg level I'd think 10A won't cut it unless it's powered by the dark arts. 1 kilo electric roaster and yes, less than 10amp @ 230V was an intentional requirement in the original spec. The in progress vimeo was "leaked" by someone, the real video should be released soon. Can't seem to find the video anymore (or a public one) - but the product website is now up. There appears to be another new Behmor 1600AB Plus coming soon too, which will replace the Behmor 1600Plus . Does anyone know when this will occur? The 220v version will be a way off yet as it still hasn’t been submitted for Australian electrical compliance testing. So frustrating as you can't get an old Behmor model here anymore! I feel like theres nothing in the $500 range now. 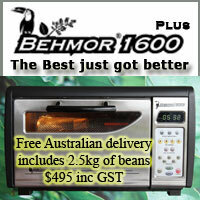 We build the AU/NZ Behmor 1600 and we sadly ran out of stock at Christmas. The factory is taking longer then expected to build and certify this one but when it happens it will appear here on CoffeeSnobs and our NZ disty will get stock on the ground soon after. See the description in BeanBay and get added to the notification list for when they arrive. Second hand ones do pop up occasionally. Keep your eye on the forum and eBay if you’re in Australia or Trade Me in NZ. Also Green Bean House in NZ have sold a few lots of refurbished ones over the last year to people that are on their mailing list.